On tough writing days, write for time, not distance. Set your timer for ten minutes and write until the timer chimes. If you can find four chunks of ten minutes in your busy day, you’ll make a big dent into your word count. [Character name] awoke with sense of dread that [another character name] would . 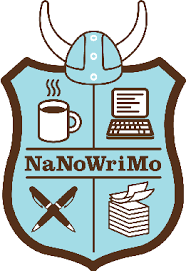 . .
NaNoWriMo stands for National Novel Writing Month and it takes place every November. Anyone can do it. You can sign up on the website (you don’t have to). You can go to events in your region (you don’t have to). You can donate and (or) buy fabulous swag (you should probably do that one; they’re a fabulous non-profit). But really all you have to do is write 1666 words a day for thirty days starting November 1 and ending November 30th, which leaves you with 50,000 words. A novel in a month. Simple? Yes. Easy? Uh, no. But here are five easy tips you can implement now in October if you are considering tackling this generative writing goal.